Oh my. Its Friday! I know today is going to be quite busy for me, but I wanted to share a few of my "Friday Finds". 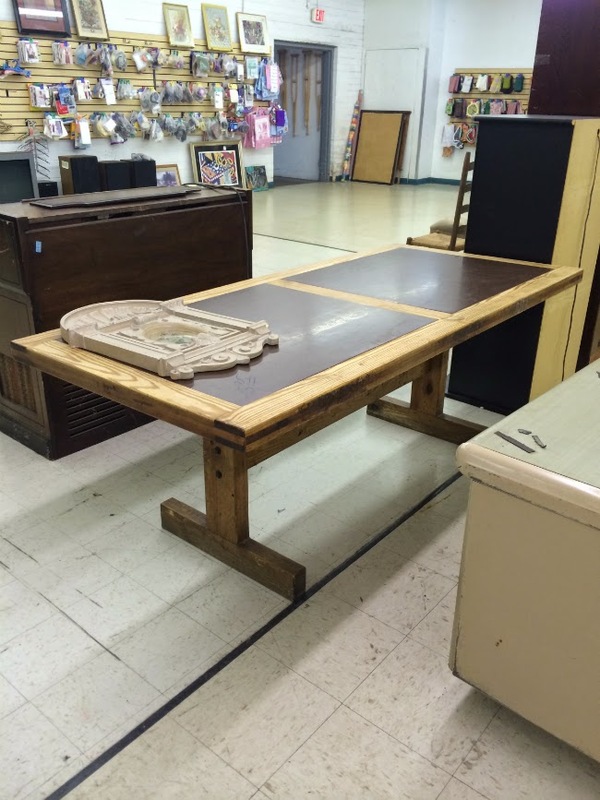 I did not buy any of these pieces as I don't have a need for them, but all of these were at great prices and would excellent candidates for a make for someone's home. 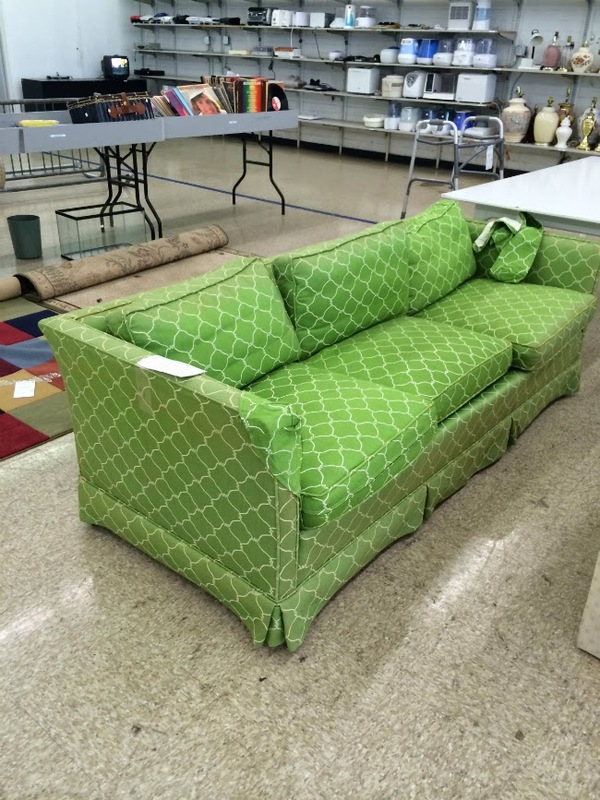 Finding a great sofa in a thrift store is rare for me, because of the style and color sofa I prefer. Since everyone's taste is different this sofa would be right at home for a number of you. I could actually decorate a bright and fun room around this piece. I would take off the skirt and expose the legs for sure. Perhaps this sofa was 80 some odd dollars? I cant remember, but it is a great buy. I know someone is going to ask about bed bugs. That is not an issue here in the South. So I never worry about it. If you are in New York, that's a different story. As always, you are required to buy anything, so if you are scared about bed bugs...ummm. I so wanted this rustic table. It was so sturdy. Of course I want to repaint it. I will admit the wood makes this table amazingly beautiful. 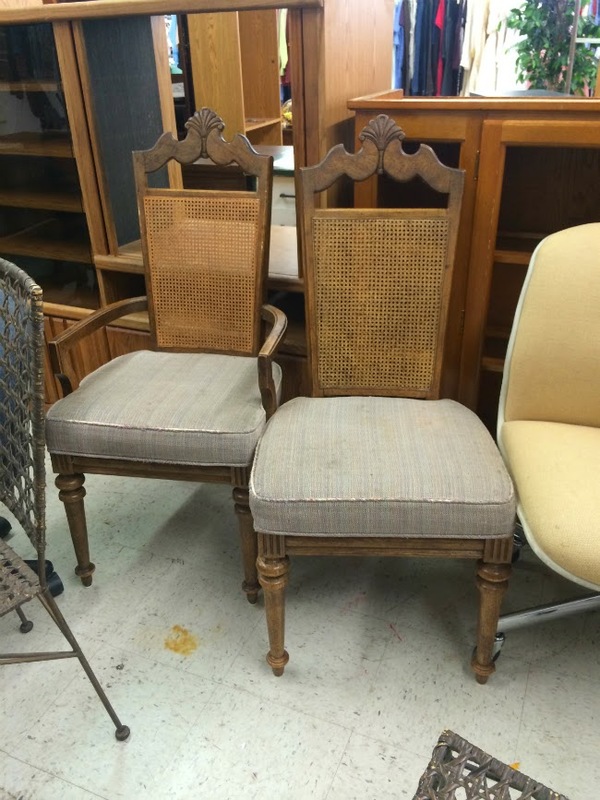 Side Chairs are really abundant at thrift stores. Some of the prices have gotten a bit high, but some are very reasonable as well. Like these. I think they were $15 a piece. In order to get the same look they would definitely have to be take to a professional upholsterer. OR you could take THIS CLASS and walk away with amazing skills on how to redo them yourself! 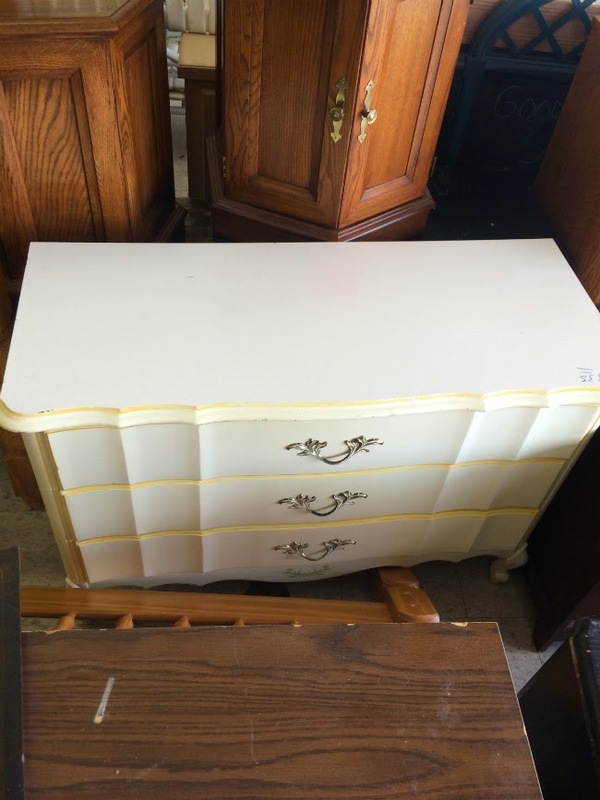 The problem I find with dressers is at thrift stores is this. I want to take them all home! The other problem is, I dont have the space, neither a truck. Ive got 99 problems and most of them deal with dressers and thrift stores. If you have a little time on your hands, I would so tell you to pick up a dresser make it over and put it in your home. It is completely worth it. These are just a few of the amazing pieces I came across and I wish I could rescue them all, but I cant. So I will have to leave them in hopes they find a good home.